Without a doubt the best at a loaded position, Sammy Watkins has the ability to be truly special. 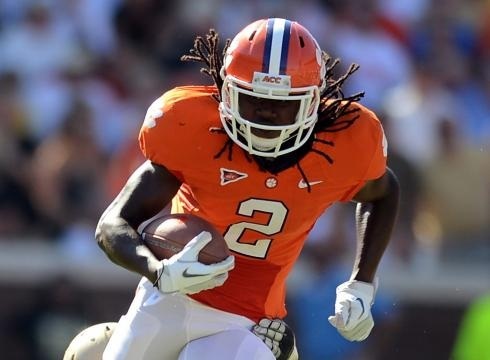 At Clemson, Watkins was given a very simplistic job, including running a ton of screen and sweep plays. If you think, that will limit him in the NFL, you aren’t watching closely enough. Watkins displays the ability to be a smooth route runner, as well as the capability to grab passes in traffic. He is a complete player, and will bring excitement right away to whatever team drafts him. The Harvin comparison is easy, given how effective Watkins is on the sweeps and screens. Harvin is very physical for his size, but Watkins is even bigger, and could best the Seahawks’ receiver in that aspect of the game. Pierre Garcon, on the other hand, is extremely underrated for what he brings to the table. He is an elite route runner, and can easily make the highlight reel catch. Sammy Watkins will bring the ability to do both at the next level as well. Watkins will be one of the better players at his position before too long. He will be a versatile weapon early, and grow into the foundation of his team’s offense. One of my favorite players in this draft class, it’s hard to find a weakness in Odell Beckham’s game. He has a freakish catch radius for a sub-six foot receiver. The height-obsessed crowd isn’t going to like this, but Beckham is probably the best receiver in traffic, and at high pointing the ball, in this year’s receiver group. He can climb the latter, and bailed out Zach Mettenberger on a number of poorly thrown balls this past season. Beckham is also one of the smoothest players you’ll watch, and moves effortlessly down the field. Simply put, this player has it all. For several seasons, Chad Johnson was one of the best receivers in the game despite being just around six feet tall. He wasn’t the biggest, or the fastest, but Ochocinco’s effortless movement allowed him to get open against the best of competition. In addition to being much more dominant at the catch point, Beckham will probably freelance a bit less than Johnson. Which means his quarterbacks will probably enjoy him much more. There is no reason to believe Odell Beckham Jr. won’t be a number one receiver in the NFL. You can point to his size, but receivers like Steve Smith and Antonio Brown have filled that role despite their limitations. The aforementioned receivers win with quickness and at the catch point, so will Beckham. Its hard not to fall in love with Mike Evans the more you watch him. With his massive frame, he just looks like a man amongst boys out there. Evans can box out anyone, and will probably be even better after the catch when he gets in an NFL offense. When a team learns to line him up in the slot, he will be devastating. Evans ran in the low 4.5’s at the NFL combine, thus he put to bed any speed concerns. Though his short area quickness was more than good enough on tape. Playing with Johnny Manziel has only added to his game, by gifting him the instincts to know how to adjust to his quarterback. It’s the go to comparison, but it works so well. Mike Evans will likely make the same great sideline catches that Jackson has throughout his career. In similar fashion, he can also be a great deep threat just because of his unreal size. If Evans lands with a creative coach who moves him around to several positions, he can be even better than Jackson after the catch. Evans could absolutely be a top option in the passing game, but would be even better in a complimentary role. He would excel moving around the formation, and exploiting lesser corners. Its hard to envision him not scoring touchdowns in bunches. I’m not sure why Jordan Matthews continues to get overlooked. It seems the consensus believes that he is maxed out, and won’t ever become a featured player. Why can’t he be though? Matthews is big, fast, and can be elusive after the catch. He doesn’t play as physical as his size would indicate he should, but perhaps that improves with better quarterback play. Matthews showed the ability to quickly adjust to poorly thrown passes. With a bit more seasoning, Matthews can become a very good weapon in the NFL. Alexander shined when he actually managed to stay on the field. He showed great speed for his size, the ability to adjust to the ball, and the potential to be a foundation piece of an offense. Matthews can have the same effect, but will be much more reliable in the health department. At the very worst, you’re getting a guy who will have a solid, 10 plus year career. If he maxes out his full potential, he can be a quarterback’s favorite option. The diminutive receiver ran one of the fastest 40 times at this year’s scouting combine. That was to be expected, as Brandin Cooks’ speed flashed throughout his college career. He is a big play waiting to happen, but Cooks can also work the underneath portion of the field. Given the NFL’s current obsession with slot receivers, Cooks will be coveted come draft day. There’s no reason he shouldn’t hear his name called in the first round. DeSean Jackson is well known for his explosive speed, and big play ability. Brandin Cooks can bring those same elements to the table. However, Cooks also shows more willingness to mix it up with players much bigger than he is. He might be more of a slot receiver in the NFL, but that won’t limit Brandin Cooks’ impact. Personally, I can see him splitting his time between the outside and inside receiver positions as well. He can rack up yards and receptions similar to Victor Cruz of the Giants. Allen Robinson brings a lot to the table. He has nice feet, good size, and seems to have good awareness. Robinson isn’t an elite athlete, but he understands where to go to pick up yards after the catch. He could be quite a threat in the short and intermediate area of the field for an NFL team. Much like Eric Decker, Allen Robinson would probably overmatched if he were asked to be a team’s number one receiver. He might not have the ability to consistently beat the opposition’s best cornerback. However, Robinson could excel across from a great receiver, and with a good quarterback. Robinson should hope to be drafted by a team like Cleveland, Dallas, or Washington. Those teams already have number ones, but desperately need a secondary receiver. He probably carves out a solid career in that role. Very underrated in this great class, Josh Huff is quite exciting. He is a very quick player, and another one of those guys that just moves effortlessly. He gets downfield in a hurry, and can make a quick cut to lose his coverage. Huff also shows that he can adjust to the ball when it isn’t delivered perfectly. Can play in the slot, and outside the numbers. Don’t be surprised if he goes in the second round and quickly climbs up his new team’s depth chart. The former first round pick never quite lived up to his potential, but Jeremy Maclin is a good player nonetheless. Huff is explosive like Maclin was before he tore his ACL, and shows the same ability to make the spectacular catch. He might end up being the better pro. Much like Tate, Huff is a compact player, and a devastating blocker. His build also helps him get yards after the catch. Josh Huff could be a fantastic number two receiver in the NFL. His quickness and speed would allow him to exploit lesser athletes in the secondary. However, he could certainly grow into a top receiver with some time. Jarvis Landry was the other receiver who consistently bailed out LSU quarterback, Zach Mettenberger. He isn’t all that big or fast but shows plenty of positive traits. Landry has strong hands, and can pluck the ball from any location. This player also seems to relish the physical side of playing wide receiver. Its unlikely Landry ever grows into a number one target, but some quarterback is going to love throwing to him for years. Driver rose from the ranks of the undrafted to become a great receiver for the Packers. Jarvis Landry won’t face such a difficult path, but he profiles a similar player. He might not put up comparable stats, but just like Donald Driver, he has vice grips for hands. You won’t find yourself bragging to your buddies about Jarvis Landry, but you’ll realize seven years down the road what a vital part he has become in the team’s offense. He’s not going to fill up the highlight reel, but he could certainly be a quarterback’s safety blanket for many seasons. With a 6’3” build and a 4.38 forty time, it’s obvious there is something here. Cody Latimer has a big frame, and unlike other players he knows how to use it—looking at you, Kelvin Benjamin. The IU product can shield defenders, and put himself in prime position to make a catch. Latimer can climb the later, and has strong hand technique to snare the ball out of the air. He isn’t the most explosive player out there, but does create enough separation. The comparison is almost eerie. Both Michael Floyd and Latimer have similar bod types, and ran a faster than explosive forty. In the NFL, Floyd is just now learning how to use his big frame the way he did at Notre Dame. He had a marvelous season this year, and has ever more room to grow. Latimer can do the same sort of thing, even if it takes time. He might not develop into a number one receiver, but Latimer will be a great pro. He will be a reliable target for a quarterback, and earn his team’s confidence. Latimer will shield defenders, and come down with clutch catches in the NFL. He has exciting potential, and a low floor to boot. I want to love Kelvin Benjamin, but I just can’t. His size is certainly imposing, and he put up some crazy numbers with Jameis Winston this year. However, those that touted him as the next Megatron had to be vastly disappointed with his 4.63 40-yard dash and 32.5 inch vertical. Athletically, he’s good, but neither the tape nor the numbers scream, “physical freak”. The propensity for concentration drops is also very concerning. Some coach could certainly force him out of it, but it could just as easily haunt him throughout his career. Benjamin shows the ability to break tackles, and bait corners with great route running; he just doesn’t do anything with enough regularity. Benjamin won’t be picked nearly as high as Edwards, but he could have a very similar career. Edwards was another big receiver with speed, but struggled with drops and consistency throughout his career. Kelvin Benjamin will be just as capable of having great years like Edwards’ 2007 season, or of finding his way out of the league early. Benjamin will probably frustrate the team that drafts him, just like the Michigan product. It could come down to the situation with Benjamin, but if he works like crazy, he could easily become a dominating force. He could be a matchup nightmare in the NFL, or follow the Jonathan Baldwin path; there likely won’t be an in between. Let someone else take that risk in the first round. Just Missed the List: Bruce Ellington and Davante Adams. Love both players, but just couldn’t fit them in. The struggle to rank these players just shows what an amazing class of receivers this is.